Well, Humboldtians, I am just bursting at the seams with thrilling foodiness. We'll start with our stalwart olive-maker friend, Henry Robertson, who has new additions to his usual smorgasbord of delicious unctuousness. 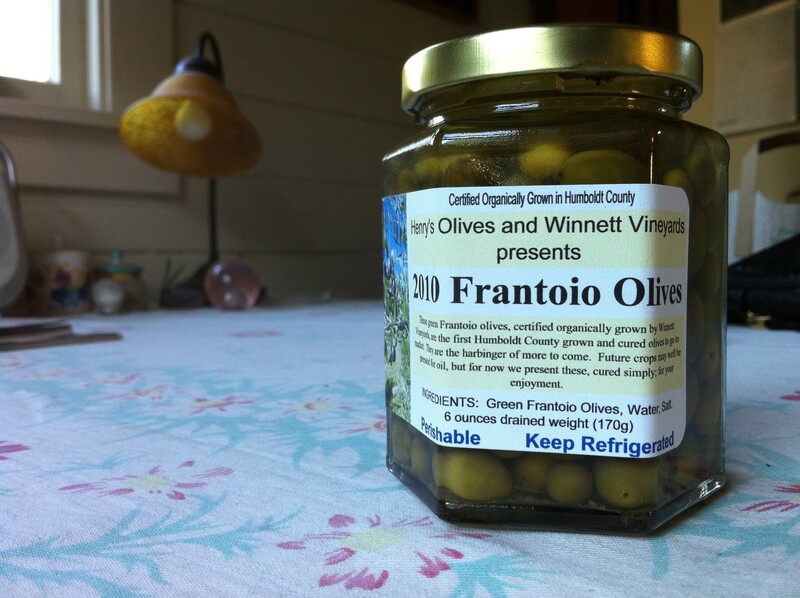 His latest olives come from the Winnett Vineyards, a small organic winery and olivery in Willow Creek. The eventual plan is to make olive oil, but they don't have quite enough olives yet, so Henry started making small batches of salt-brined, very local olives, delicious and wee. They're not the rich, plush Henry's olives we are used to; these are relatively fleshless and concrete, but intense -- really good. Henry also has this new version of Moroccan preserved Meyer lemons. Preserved lemons are a little intimidating -- eating lemon rind? -- but seriously, can three million Moroccans be wrong? Henry uses Meyer lemons, which is an interesting touch. The rind of the Meyer is thinner and sweeter; hence it might be more palatable to our American aversion to actually eating peel. They are an excellent addition to vinaigrettes and virtually any Middle Eastern-inspired fish dish. Throw some thinly chopped preserved lemons, raisins, green olives and thinly sliced potatoes over any heavily buttered filet and roast at 350 for 25 minutes. I quote: "They have a great flavor -- just lemon and salt, but with an indescribable intensity. Give them a month before using -- they just get better and better." Sterilize a 1 1/2 qt. glass jar. Put 2 Tbs. kosher salt in the bottom. Scrub 6 large, choice lemons with soap and hot water and rinse well. Cut them into quarters the long way, but leave them attached at one end. Put 1 Tbs. salt inside each lemon, and cram the lemons into the jar, pressing as best you can. Pour fresh lemon juice over to cover -- that should take about 8 lemons worth. Seal the jar and refrigerate for a month or two. The white part of the rind will become translucent. To use, take out a piece and scrape out the pulp and discard. Chop the rind. It's salty, so adjust recipes accordingly. The salty juice can be saved for another batch or used itself for lemony cooking. The Sustainable Expo last weekend was full of warm, familiar faces. The Alexandres of Alexandre Farms assure me they are doing their best to keep up with demand for the Best Pork Ever (see Table Talk "Hog Heaven," May 23, 2010). I've found it to be pretty consistently available, and always of superb quality, though Doug at the Co-op says on occasion demand outstrips supply. I was really excited to learn about the Humboldt Poultry Cooperative, who tell me they are supplementing their traveling abattoir trailer by "offering a small-scale processing equipment package called ‘Junior' for rent to the community." You supply the birds and knives; H.P.C. supplies killing cones, a scalder, chill tank, plucker and (best of all) an essential stainless steel table. It's a hundred bucks to rent -- pick up the evening before, drop off the evening after. There's an orientation (mandatory) on March 26. E-mail them at Info@HumboldtPoultry.com to save a spot or for more details (their website doesn't say anything). I personally am not so much the home slaughtering-type, but I know so many soft-hearted folks in Manila ‘n' such that can't bear the thought of simply wringing a bird's head off. That is how our Laotian neighbors do it and it seems quite effective, although not for the faint of heart. So this idea seems like an affordable way of humanely and properly preparing your own homegrown antibiotic-free local poultry. You can. Just think, your very own killing cones for a whole day! But honestly, for $100, you probably need to have quite a flock or a few friends with birds to make it worth your while -- kind of like canning or pressing cider -- so much prep there's no point unless you go big. Another chicken thing: Why did both Mary's and Rocky's brand chicken thighs start being packaged four to a container? That's a very awkward number -- not really enough to feed a family but too much for a couple. Here's a quick family favorite chickish dish. It makes lots of sauce for your rice or fried Brussels sprouts. Brush mushrooms off. Heat a little oil in a large casserole pan over high heat. Add mushrooms and herbs. It will sizzle fantastically. Stir until liquid comes out and evaporates. Remove mushrooms and set aside. Separate breasts into large flat pieces; pound to thin and tenderize. Sprinkle breasts with lemon juice, salt and pepper; dredge in flour. In same pan over medium heat, sear pieces on each side two by two, adding a minimal amount of oil each time. Return mushrooms and chicken to pan, and add the yogurt. Turn down flame very low and cover, until simmering hot. Do not boil or the yogurt will separate. Simmer about 2 more minutes; finish with lots of fresh pepper. Serve with rice. Jada Brotman grew up in Arcata before moving to the U.K. and then New York City, where she cut a wide swath in the world of cheese. Insert joke here. She returned to the home of her fathers four years ago, and now works as a journalist and seasons her crepe pans in downtown Arcata.